At Velasquez Complete Auto Care, we want our customers to have the opportunity to feel comfortable in their vehicle. 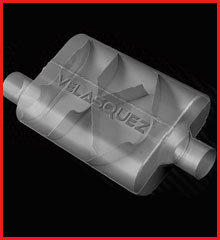 Velasquez Complete Auto Care works on mufflers & exhausts for all makes and models. All vehicles can be serviced by our ASE certified mechanics. Bring your cars, trucks, SUVs & vans to one of our locally owned and family operated auto shops! The exhaust pipe plays a key role in diverting exhaust fumes out of your engine, which in turn keeps your vehicle running smoothly. Built up exhaust fumes can ultimately cause engine deterioration, which makes it important to have your exhaust pipe regularly inspected. If you hear vibrating when your car is running or if it experiences a loss of power, bring it in for a free exhaust inspection. Let the shop know where you noticed the vibration coming from: the steering wheel, operating pedals & etc. It could be a result of a hole, disconnected part, or a leak in the exhaust system. The problem may or may not include a rumbling sound, that depends on the size of the damaged area. The vibrations are not just signaling a problem with the muffler or exhaust, it also signals that your engine is likely not performing at peak levels. The catalytic converter is the most costly part of your exhaust system. If your catalytic converter begins to fail, you will hear loud sounds. A failing catalytic converter sounds like someone shaking a metal box filled with quarters while your car is in idle. You may want to your check if your engine light is on. A deep humming noise coming out of your exhaust pipe is a signal that you have a muffler or exhaust problem. Having it repaired quickly is the right move. It is important that you replace a muffler or exhaust that is damaged, it can lead to other exhaust and engine problems that will make it more expensive. If you notice you don’t get as much MPG out of your gas fill-ups, take your car to Velasquez Complete Auto Care shops for an inspection. As with vibrations, loss of fuel efficiency might be a sign of a vehicle exhaust system problem. Exhaust leaks makes your engine work harder, which requires more gas. Check Out Our Latest Muffler & Exhaust Coupons! Our muffler & exhaust coupons and seasonal specials make it affordable to have your repairs performed by a professional mechanic. Visit one of our 12+ plus locations to find a shop near you!